GAUCI. 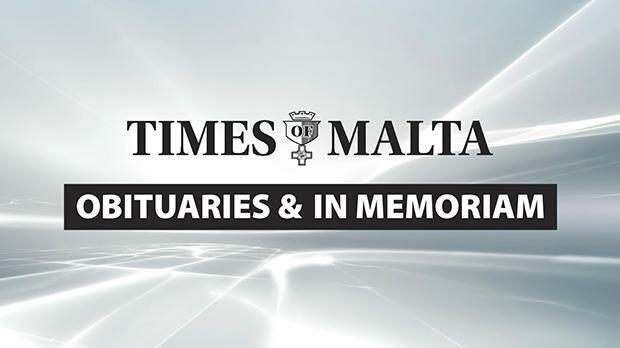 On March 20, GEORGE, of Victoria, Gozo, (ex-teacher), aged 82, passed peacefully away in the arms of his wife, com­forted by the rites of the Holy Church. He leaves to mourn his great loss his wife Lina, his brothers Rev. Can John and Tarcisio, his sisters Luigia and her husband Joseph, Marisa, Carmen, widow of his brother Anthony, his brothers-in-law Joseph, Maurice and Victor, nephews, nieces, cousins, other relatives, among whom Fr Ugolin Scerri, OFM Conv., and Fr Joseph, OFM Conv., and friends, especially members of the Legion of Mary, of which he was a member since the age of 17 until his death. The funeral cortége leaves Gozo General Hospital tomorrow Monday, March 25, at 4.30pm for St George’s Basilica, Victoria, where Mass praesente cadavere will be said at 5pm, followed by interment in the family grave at St Mary’s cemetery, Victoria. Donations to missions/charitable institutions of one’s choice will be greatly appreciated. Lord grant him eternal rest. MUSCAT. On Saturday, March 23 at 8pm, MARIA passed peacefully away comforted by the rites of the Holy Church and surrounded by all her family, leaving beautiful memories of a dear wife, and a loving and dedicated mother and grandmother. She leaves to mourn her loss her beloved husband Benny and her children Lara and Gordon, Ben and Nadine, her adored grandchildren Jake, Kane, Kate, Mia and Sienna, her brother John and Josephine, her sisters, Edwidge and Michael, Christine and Bjorn, and Josianne, her nephews and nieces, dear relatives and close friends here in Malta and abroad, and all the loving staff at Ta’ Marija Restaurant, La Buona Trattoria Del Nonno and Palazzo Pescatore. The funeral will be held on Tuesday, March 26 at 3pm at Our Lady of Sorrows church, St Paul’s Bay. No flowers by request but donations to the Malta Community Chest Fund will be appreciated. Special thanks to her dear nephew Brian and Debbie, and the staff, doctors and nurses of Mater Dei for their special attention and care. May God grant her eternal rest. She will be sorely missed. ANASTASI – ANTOINETTE (Lina). On the first anniversary of her demise. Remember her in your prayers. Simone, Patrick and their families. BONETT – FRANK. In loving memory of a loving father on the 38th anniversary of his death. So sadly missed by his daughters Stephanie and Josianne and in-laws. May the Lord grant him eternal rest. BORG CARBOTT – FRANCES. Cherished memories of a very dear mother and grandmother on the 35th anniversary of her demise. Sadly missed and fondly remembered by her children, in-laws and grandchildren. Lord, grant her eternal rest. DANDRIA – LAURA, née Ullo, a beloved mother and grandmother on the 40th anniversary of her demise. A prayer is solicited. DINGLI. In loving memory of Dr FRANCIS DINGLI, MD, March 22 being the 37th anniversary of his demise. Forever missed by his family. Dear Lord, grant him eternal rest. FENECH – SALVU. Today being the fifth anniversary of his passing away. Fondly re­membered by his wife Antoinette, his children Roberta and her husband Kurt and Brian, his brothers and sisters, in-laws, other relatives and friends. Always in our thoughts and prayers. Lord, grant him eternal rest. FIORENTINO – JOHN. Sweet and loving memories of a dear father, grandfather and great-grandfather, today his 35th anniversary and always. His family. FORMOSA-HOLT. Ever treasured memories of our dear WILLIAM on the 23rd anniversary of his death. Sadly missed by all his family. Lord, grant him eternal rest. MERCIECA. In loving memory of our parents ALBERT and OLGA, née Pace, on the anniversary of their death, March 24 and 25. Sadly missed by Marguerite and Franca and their families. Lord, grant them eternal rest. PACE – ANNA (Poachie). In loving memory of our very dear sister who died at the tender age of 18, today the anniversary of her death. Her brothers and sisters, Sandra, Mark, Marian, John and their respective families. Kindly remember her in your prayers. PORTELLI – JULIET. In loving memory of a dear mother, grand­mother and great-grandmother on the sixth anniversary of her demise. Loved and sadly missed by her sons and daughter, relatives and friends. May the Lord grant her eternal rest. SACCO – THERESA, née Parascandalo, widow of Remiġ. In treasured memory of a beloved mother and grandmother who went to meet the Risen Lord on March 24, four years ago. Her sons and daughters and grandchildren.